This essentially means that you’re repackaging content that you already have. For instance, maybe you’ve put together a couple of blog entries around a particular topic. You can combine multiple entries into a longer white paper. Vise versa, maybe you have a Sage or Microsoft White paper and decide to break it up into bite-sized pieces and create individual articles. The basic idea here is to take a look at your library of existing content including press releases, white papers, blog posts, success stories, older articles, etc. and see if you can re-use that content in a different format. This one is pretty straight forward. The more success stories and testimonials you have, the more content you can share and demonstrate your expertise. This means that you’re looking beyond your marketing department and recruiting folks in other departments that may have thoughts or stories to share. We’ve seen Sage partners doing this on their blogs where they might have a consultant write an entry that shares an experience from the field or the details of a recent customer support request. It’s compelling content that demonstrates your unique experience. 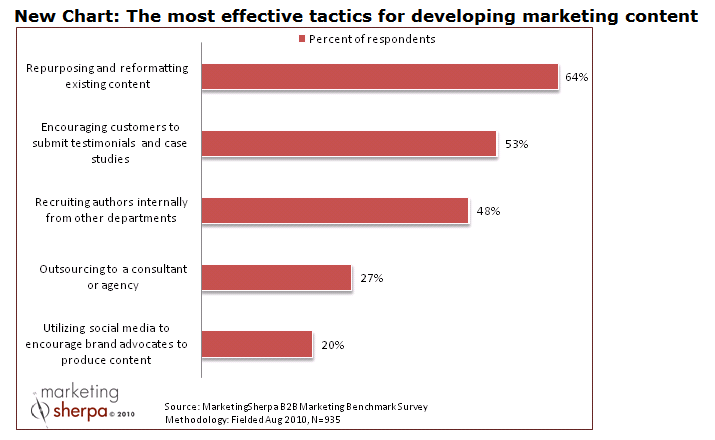 At 27%, this isn’t the most popular approach for B2B companies. But Marketing Sherpa does point out that the challenge here is finding a marketing agency that really understands your market … particularly smaller niche markets. They need to understand the industry language and use it in the right context. A challenge that’s prevalent (technical jargon, that is) in the Sage and Microsoft VAR channel. To be honest, I don’t know what they’re eluding to here and Marketing Sherpa didn’t provide details on this survey response. It sounds like marketing gibberish … but I’m guessing that the companies that responded with this answer are connecting with colleagues, customers, and other advocates through social media and encouraging those folks to write favorable articles and reviews. At Juice Marketing, we’re cranking out content all the time for Sage and Microsoft resellers, ISVs, and channel partners. And since we specialize in VAR Marketing for technology providers, we understand the lingo. So check us out next time you need off-the-shelf technology articles, a success story, a press release, a Sage product newsletter, or anything else from the wide range of VAR Marketing Programs we offer. Perhaps best of all, you save a bunch of dough because we’re a Sage Preferred Vendor and pre-approved for at least 60% co-op reimbursement (more in some cases). How are YOU generating content to stay top of mind with customers and prospects? Do any of these tactics work for you? Do you have others that are effective and not mentioned here? We’d love to hear your feedback.